Looking for a USED PBA-H3011? 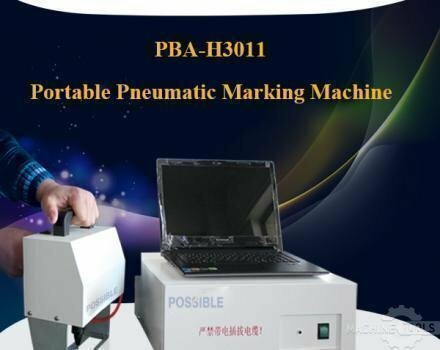 1.Handheld Pneumatic Marking Machine is automatically incremented and the value optional. 2. The software can be auto updated with the date and printed. 3. The software is with the function of auto adjustment and trace. As the marking location changes, the marking needle can move to the new location. 4. Input methods using manual input, made by different contents of different type of print documents, workpiece management. 5. This machine with graphics editor print function, the user can need according to oneself, use AUTOCAD editing some simple graphics, through this marker print system in the printed by marking. It’s also with the CORELDRAW,PHOTOSHOP and others. 6.The software can directly mark the scale. 7.The software owns the output function of Diametric. 8. Many characters for optional, as more than 200 types English characters. 9. It can mark different characters same time with the rotary angles. 10. There is data record and query function with the machine software. 11. The software can read the data direct from the textfile. 12. There is external routine interface in the software. Through the SQL script, it can connect the external database. 13. Automatically marking function after start without human intervention. 14. Non paint break-up after marking. Looking to Purchase a New POSSIBLE PBA-H3011?